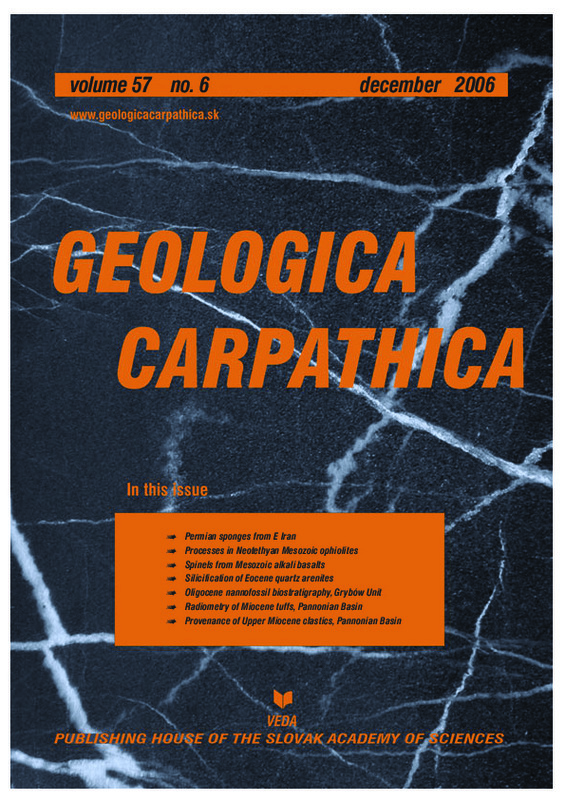 Abstract: The origin of the flat-lying body of quartzite at Skalice near Litomerice, Ohre Rift graben, Bohemian Massif, is explained by the effect of emplacement of dense tuff of tephritic mineral composition on Eocene quartz sands. In the upper part of the ca. 10 m thick quartzite body, broad quartz overgrowths on detrital grains are visible in CL images, with individual zones/bands having variable Al contents. The lower part of the quartzite body features isopachous growth bands with less variation in Al contents, passing to euhedral quartz precipitation. Porosity of the quartzite decreases upwards, reaching 3.8 % below the tuff base. Two main silicification stages are inferred: 1. dealkalization of the tuff and volcanic glass recrystallization, reflected in isopachous precipitation of poorly crystalline silica in deeper parts of the quartzite profile from fluids with high silica concentration and high amount of impurities; 2. hydrothermal argillization of the basal tuff portions connected with the origin of euhedral quartz cement deeper in the quartzite profile and opal coatings in shallower parts of the profile. Simple mass balance calculation shows that the tuff itself could not produce much silica for the underlying quartzite, and that most silica was produced by the corrosion and dissolution of sand grains by alkaline fluids in a zone immediately underlying the tuff. The Skalice quartzite should be viewed as a product of hydrothermal silicification rather than silcretization.